Greenspun Hall, located at the corner of Maryland Parkway and University Road, serves as the home for five of the college's academic programs. At 120,000 square feet, this massive five-story building features an auditorium, high-definition (HD) media facilities for KUNV-FM and UNLV-TV, student media laboratories and classrooms, and faculty offices. The Auditorium: featuring a state-of-the-art video, lighting, and sound equipment, this nearly 200-seat auditorium is ideal for speakers and presentations. The Greenspun family has played a major role in the growth and development of the Las Vegas Valley since patriarch Herman Milton "Hank" Greenspun was a partner in the opening of radio station KRAM 920 AM in 1947 and published the first issue of The Las Vegas Sun newspaper in 1950. Mr. Greenspun was known as a champion of the "little guy" and a man of great conviction and commitment. He was also known as one of Southern Nevada's top land developers. Greenspun and his family have been instrumental in the growth of UNLV. Because of the family's leadership and generosity, UNLV was able to establish the Greenspun College of Urban Affairs and the Hank Greenspun School of Journalism and Media Studies to carry on Mr. Greenspun's legacy. With the State of Nevada, the family made possible the five-story Greenspun Hall which houses the Greenspun College of Urban Affairs. It stands as a wonderful tribute to the many contributions the Greenspuns have made not only to UNLV but to the entire Southern Nevada region. The groundbreaking of Greenspun Hall took place in January 2007 and was followed by a "topping off" ceremony in September, marking the final portion of concrete set into the last floor of the building. About 200 people attended the event, including the construction crew. Former Urban Affairs College Dean Martha Watson, played a major role in planning the building with the architects, HKS Architects Inc. in association with Robert A.M. Stern Architects, joined members of the Greenspun family and other dignitaries. Construction was completed in the summer of 2008, and faculty and staff made "the big move" to their new home in early September 2008. 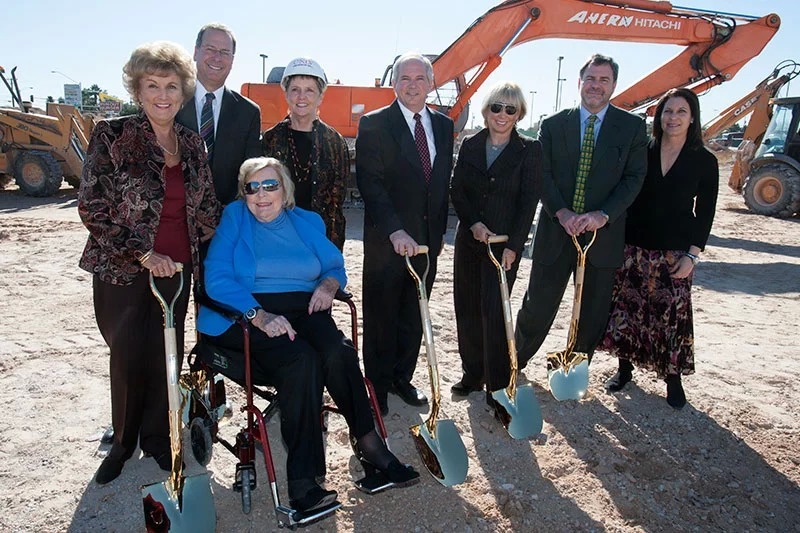 The Greenspun Family with former UNLV Presidents Carol Harter and David Ashley at the groundbreaking of Greenspun Hall in 2007.